Herbs with its diversity, physiological and pharmacological effects, and quantity of healthy materials, provide unlimited possibilities in the continued development of the health and educational tourism, especially in the production of the wide range of phytopharmaceuticals. Previous studies in this area have confirmed nearly 600 medicinal, edible, vitamin and aromatic wild plants. Trnovo provides ideal natural environment for sport hunting, but also for the development of hunting as one of the segments for the further development of economy of this area. 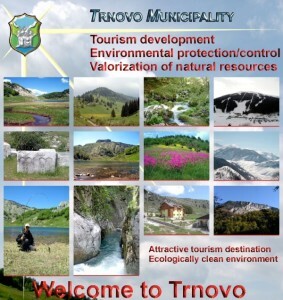 Due to the natural characteristics of Trnovo, it can be concluded that the greatest potential for development of the municipality lies in the field of tourism and agriculture, and in the utilization of hydro and wind potential and wood-processing industry. Key economic factors that encourage economic development in urban and rural areas of Trnovo represent favorable natural resources for agriculture, especially organic, production and organized purchase of agricultural products, good infrastructure (roads, water supply, electric power grid, phones), constructed infrastructure tourist facilities, great potentials for all types of tourism etc.